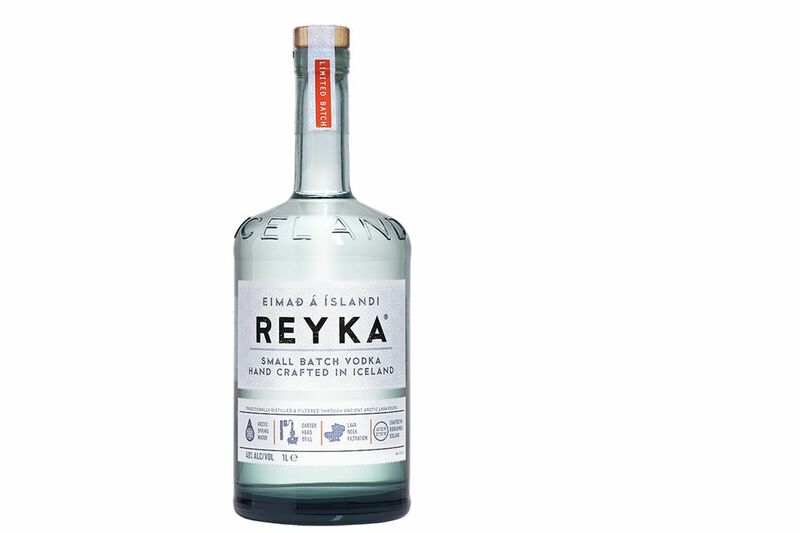 A number of distilled spirits have employed the pure Icelandic waters in their production, but Reyka Vodka takes complete advantage of the country's pristine natural resources. It was the first to be distilled and bottled in the country and boasts an emission-free distillery that relies on the area's volcanic activity. The result is a super clean, premium vodka that has an environmental conscience. This is one of the smoothest vodkas you will taste. It's great on its own and is reasonably priced, so it's perfect for cocktails as well. Amidst the clean air of the village of Borgarnes on the western coast of Iceland sits the distillery where Reyka Vodka comes together. It is in the shadows of the majestic Mt. Hafnarfjall. The entire operation is run by the abundant geothermal heat of the land, and this led to the naming of the spirit. Reyka (Ray-KUH) is an ancient Icelandic word for "steam" or "smoke." The key to this barley-based vodka is the glacial water sourced from Grabok Spring, which runs through a 4,000-year-old lava field. The rock naturally filters the water, resulting in some of the purest water on Earth. Researchers that have tested these waters found there to be zero impurities. With a well-crafted distillate and super clean water, Reyka gets a great start to becoming one of the smoothest vodkas you can find. This is only enhanced with the Carter-Head Still that the distillery uses to refine the spirit. One of only a few stills of its kind used in the world, the copper used in it helps retain the vodka's cleanliness. Unlike so many other vodkas in the world which tout countless distillations, there is no need for more than one trip through this still. To finish off the vodka, it is filtered through the same lava rock that its water passed through. It is bottled at 40 percent alcohol by volume (80 proof). The resulting "uniquely Icelandic" vodka is a testament that if clean products go in, clean products come out. Reyka Vodka is a small-batch vodka. The six-hour distillation process produces only 255 cases at a time. In the vodka world, that is minuscule. It's not sold at a luxury price. For the pristine taste that it offers, you might be surprised to know that it sells between $20 and $30. Though it is hand-crafted, the vodka is also backed by a great lineage in the liquor industry. William Grant & Sons is the company behind the scenes. The Scottish company is known for creating great brands like the iconic scotches from The Glenfiddich and The Balvenie, as well as the groundbreaking Hendrick's Gin. Reyka Vodka was first released in 2005, and it quickly became a favorite among vodka connoisseurs while many specialty vodkas of that era have come and gone in the years since this one has not only held true to its roots and picked up many dedicated fans along the way. Reyka has a strong "green" aspect to it. A delightful nose of sweet rose and fresh-cut hay fills the senses with clarity. The palate is silky and marked with rose, lavender, and a surprisingly spicy cedar — a short finish with undertones of warm citrus and grain complete the experience with uplifting purity. Since it is so clean and smooth, Reyka is an ideal vodka to enjoy on its own. Whether straight, chilled, or on the rocks, it's so much like drinking water that it's easy to forget that there's alcohol inside. Try it over ice with two dashes of Angostura Bitters for a beautifully herbal, earthy sipper that refreshes and uplifts the palate. This is also a perfect base for any cocktail. Whether it's dry, sweet, fruity, or herbal, you cannot go wrong with Rekya in any drink recipe. It makes a fabulous vodka martini and can enhance any of your favorite vodka concoctions. Try it in a vodka collins, an espresso martini, a cosmopolitan, or whatever you feel like drinking tonight. Since it's also reasonably priced, Reyka is a perfect option as the premium vodka to stock in your bar. It does outshine most top-shelf vodkas, even those that sell for twice the price. The difference here is that you won't feel guilty about pouring it into any drink. Where Can You Find Blavod (the Black Vodka) in the U.S.?